Hey Guys! This week I thought I would share with you my current skin care routine. I currently only use cruelty free and natural skin care products. As I have extremely dry and sensitive skin and I find that natural products are more gentle and are none irritating. I start of by dampening my face with warm water and then I use the Sukin Sensitive Cleanser. I LOVE this cleanser! it’s so gentle and moisturizing. It does a great job of removing my makeup and leaves my face feeling so hydrated and soft. About twice a week I go in with an exfoliant after cleansing, ATM I switch between two exfoliants. The Amie Naturally Kind, Deep Pore Exfoliating Polish. And the Larissa Bright, Papaya Exfoliant Scrub. I rotate using them as the Amie Naturally Kind is softer and the Larissa Bright is a rougher exfoliant. That I tend to use when I feel like my skin is in need of a refresh. 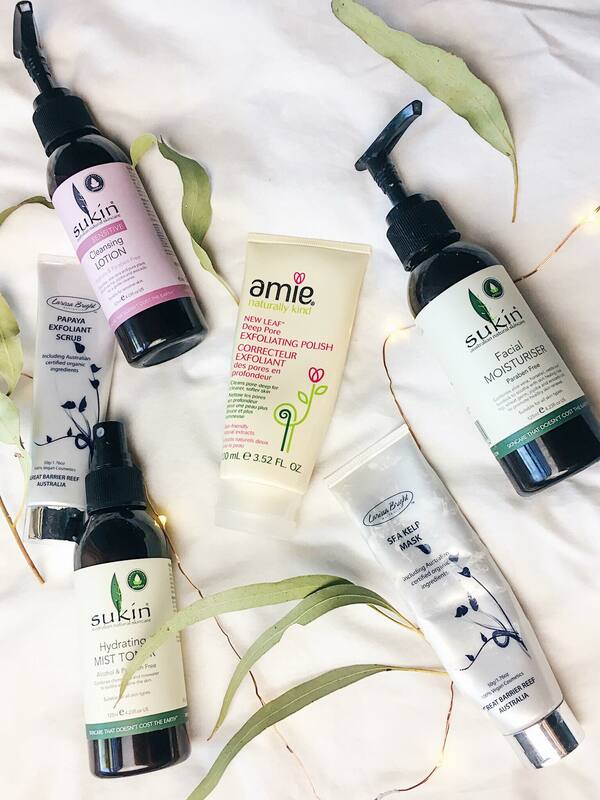 After I have cleansed and exfoliated I use the Sukin Hydrating Mist Toner. I like the Sukin Toner as it has no alcohol in it so it doesn’t dry out my already extremely dry skin. I also find that its a great pick me up and helps to wake my skin up. This step is totally optional and it’s not something I tend to do all the time. But when I feel like taking a bit of extra time to pamper myself, I will use the Larissa Bright Sea Kelp Face Mask. I love it because it is a clay mask that dries super quickly and leaves my face feeling sooo soft! I love this, and will defo be incorporating some these steps to my skin care routine! 5 Podcasts You NEED To Listen To!